HEALTH MINISTER SIMON Harris is to bring proposals to introduce safe access zones around premises providing abortion services in the new year. The new law will prevent women from being subjected to unwanted communications and visual displays when accessing services for the termination of a pregnancy. The legislation will also prohibit the photography of anyone in a safe zone accessing the services. Deirdre Duffy, Together for Yes Campaign Manager and Fine Gael general election candidate called on the minister to bring in the exclusionary zones immediately. She said there was an “urgent requirement” for legislation to introduce safe or exclusionary zones near medical centres, and urged Harris to progress the legislation in early 2019. During the summer, the minister said he was determined to introduce the zones, stating that his department was examining how the issue was dealt with in other jurisdictions. 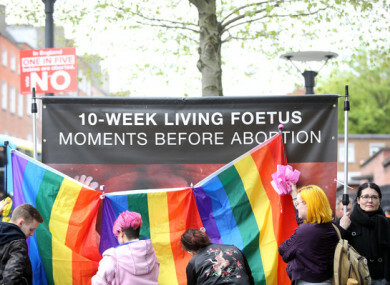 The scenes outside the Rotunda maternity hospital in Dublin during the summer, where graphic posters were unfurled, were described by the minister as “despicable”. The display of the banners, he said, “should be a cause of grave concern for any decent person in this country regardless of their view on the Eighth Amendment”. And while the setting up of exclusion zones was being pursued he said “it shouldn’t take the passage of any piece of law for people to act with basic decency at their core”. When publishing the proposed abortion legislation, Harris outlined that separate legislation would be introduced to establish safe exclusionary zones. It is understood there is ongoing consultation with the Attorney General’s office on the new laws, and it is expect to be able to move forward in early 2019 with proposals to introduce safe access zones. A spokesperson for the health minister said “it is the minister’s intention that services for termination of pregnancy will be a normal and lawful part of healthcare provision for women”. It is nevertheless recognised that these services have carry a significant likelihood of demonstrations taking place which may be distressing and upsetting both for service users and others. The minister has secured government approval to draft legislative proposals to ensure that premises at which health services are provided and the area immediately adjacent thereto are safe access zones, which can be accessed by the providers, their servants or agents, patients, and members of the public without fear of intimidation or harassment and without being subjected to unwanted communications by any means, including oral, written and/or visual displays, in relation to services for termination of pregnancy. The spokesperson added that Harris also intends that the legislation prohibits interfering or communicating with a person in a safe access zone in a way that “causes distress, and to prohibit capturing and/or distributing images of any person in a safe access zone”. They added that it should be noted that these provisions would not limit freedom of speech or prevent demonstrations against termination of pregnancy locations other than outside health services (for example, outside Leinster House). Email “Safe zone law around GP clinics offering abortions will prohibit photos being taken of women”. Feedback on “Safe zone law around GP clinics offering abortions will prohibit photos being taken of women”.